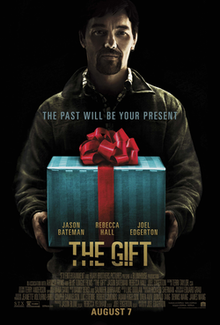 The Gift is a 2015 psychological thriller film written, co-produced, and directed by Joel Edgerton in his feature directorial debut, and co-produced by Jason Blum and Rebecca Yeldham. The film stars Jason Bateman and Rebecca Hall as a couple intimidated by a past figure played by Edgerton. It was released in the United States on August 7, 2015, by STX Entertainment. The film grossed $59 million worldwide on a budget of $5 million. A married couple, Simon and Robyn Callem, relocate from Chicago to a Los Angeles suburb after Simon takes a new job. While out shopping, they run into Gordon "Gordo" Moseley, Simon's former high school classmate. Gordo begins dropping in unannounced and delivering gifts including koi for their pond. He makes Simon uncomfortable, but Robyn sees no problem. Gordo invites the couple to his large and elegant home. He receives a phone call and leaves abruptly, making Simon more suspicious. When he returns, Simon tells him to stay away from his family. The next day, Robyn finds the koi dead and their dog missing. Simon drives to Gordo's house to confront him, but discovers it is not actually his home. In the days following, Robyn suspects she is not alone in the house while Simon is at work. Unable to sleep, she steals prescription pills from her neighbor and one morning faints. The dog returns and Robyn receives a letter of apology from Gordo. She is puzzled by his writing that he was "willing to let bygones be bygones". Simon says he does not know what it refers to and refuses to make peace with Gordo, telling Robyn that her pills are making her paranoid. Robyn becomes pregnant. At her baby shower, Simon's sister tells her that, at school, Simon and his friend Greg reported that Gordo had been molested. Gordo was bullied afterwards and had to transfer. Robyn finds Greg, who reveals that the molestation story was fabricated by Simon, who was a bully with a "real mean streak." As a result of the story, Gordo's father thought he was gay and nearly killed him, before shipping him off to military school. When asked why Simon would do such a thing, Greg replies "because he could." Robyn searches Simon's home office and discovers that he has run background checks on Gordo, who has spent his life in and out of prison, and someone named Danny McDonald. Robyn learns Simon has beaten Danny for a promotion after troubling information was revealed from Danny's previous job. Robyn confronts Simon about Gordo, but he denies responsibility. Simon angrily blames Robyn's suggestions of reconciliation on her own past traumas of being bullied at school. At Robyn's behest, Simon tracks down Gordo and half-heartedly apologizes, but Gordo does not accept his apology. Furious, Simon attacks him. Simon's promotion party is interrupted by Danny, who says Simon fabricated the information that ruined his career. Robyn goes into labor and gives birth to a boy. The next morning, Simon receives a call from his boss telling him that his fraud has been discovered and he will not be keeping his job. Robyn tells him that she wants to separate. Simon goes home and finds another gift box, containing footage of Gordo preparing to sexually assault Robyn after she fainted months earlier. Meanwhile, Gordo visits Robyn in the hospital to congratulate her, wearing his arm in a sling; he tells her Simon injured him. Simon rushes to the hospital but misses Gordo. Gordo calls him soon after, taunting him, refusing to confirm or deny that he raped Robyn, leaving Simon to wonder whether the baby is his. With his marriage and career destroyed, Simon breaks down. Gordo watches through a window and walks away, removing his arm sling. The project was announced in August 2012, when it was reported that Joel Edgerton had written a psychological thriller script titled Weirdo, with which Edgerton would also be making his directing debut. His inspirations for the screenplay included Alfred Hitchcock, Fatal Attraction and Michael Haneke's 2005 French film Caché, as well as Park Chan-wook's Vengeance Trilogy. Principal photography began on January 19, 2015, and ended on February 20, 2015. A majority of filming took place at a home in the Hollywood Hills neighborhood, where STX Entertainment also held promotional interviews for the film. The film was shot on an Arri Alexa with Canon K35 lenses, and was filmed in 25 days, according to its cinematographer, Eduard Grau. Grau was recommended by Nash Edgerton, who served as the film's stunt coordinator, after the two were part of the production for the 2013 short film Streetcar. In an interview with Collider, Edgerton revealed that he did not start filming his acting role until two weeks into shooting (devoting that time, instead, solely to directing). As soon as he did, his older brother Nash assisted on set behind the camera. Edgerton completed shooting his role as Gordo in seven days. Post-production took eleven weeks from March–June 2015. Luke Doolan also edited Sundance winner Animal Kingdom (also starring Edgerton). On January 20, 2015, STX Entertainment bought the United States distribution rights to the film. STX retitled the film The Gift. STX initially set The Gift for domestic release on July 31, 2015, and later moved it to August 7, 2015. Available on Netflix streaming in March, 2018. The first trailer was released on April 1, 2015. It premiered on Twitter's live video streaming app Periscope, making STX Entertainment the first advertiser to work with Twitter on a campaign incorporating Periscope. The Gift grossed $43.8 million in North America and $15.2 million in other territories for a worldwide total of $59 million, against a budget of $5 million. In its opening weekend, the grossed $11.9 million, finishing third at the box office behind Mission: Impossible – Rogue Nation ($28.5 million) and fellow newcomer Fantastic Four ($25.7 million). On review aggregator website Rotten Tomatoes, the film has a rating of 92%, based on 172 reviews, with an average rating of 7.4/10. The site's critical consensus reads, "The Gift is wickedly smart and playfully subversive, challenging the audience's expectations while leaving them leaning on the edges of their seats." Metacritic gives the film a score of 77 out of 100, based on 31 critics, indicating "generally favorable reviews". On CinemaScore, audiences gave the film an average grade of "B" on an A+ to F scale. Time Out's Daisy Bowie-Sell praised The Gift as "darkly unnerving", commending its ending and comparing it positively to a similar film, The Hand That Rocks the Cradle. In a review for Indiewire, Katie Walsh lamented the film's use of common thriller cliches and restraint towards the climax, but lauded Joel Edgerton's direction, concluding: "His deft, controlled maneuvering of plot, character, style, and tone is damn near perfect for his feature debut—even if it is in service of a very standard genre piece." ^ Holmes, Mannie (July 31, 2015). "Joel Edgerton, Jason Bateman Celebrate STX Entertainment's First Premiere of 'The Gift'". Variety. Retrieved August 5, 2015. ^ "THE GIFT (15)". British Board of Film Classification. July 21, 2015. Retrieved July 21, 2015. ^ Busch, Anita (August 4, 2015). "'Fantastic Four' Will Top Busy Box Office Weekend – Preview". Deadline Hollywood. Retrieved August 5, 2015. ^ a b Chai, Barbara (July 29, 2015). "In Directorial Debut, Actor Joel Edgerton Delivers a 'Gift'". The Wall Street Journal. Retrieved August 4, 2015. ^ a b "The Gift (2015)". Box Office Mojo. Retrieved October 22, 2015. ^ Fleming Jr, Mike (January 13, 2015). "Jon Bateman To Star In Joel Edgerton's Helming Debut". Deadline Hollywood. Retrieved April 2, 2015. ^ Sneider, Jeff; Ge, Linda (November 3, 2014). "Rebecca Hall to Star in Joel Edgerton's Directorial Debut (Exclusive)". thewrap. Retrieved April 2, 2015. ^ George, Sandy (September 9, 2013). "Joel Edgerton to shoot debut feature in California". screendaily.com. Retrieved April 2, 2015. ^ Lloyd, Kenji (May 21, 2015). "The Gift UK Release Date Set for August; Jason Bateman, Rebecca Hall & Joel Edgerton Star". Final Reel. ^ Eisenberg, Eric (August 15, 2012). "Joel Edgerton Developing Psychological Thriller Weirdo As Directorial Debut". cinemablend.com. Retrieved April 2, 2015. ^ Oster, James (August 3, 2015). "The Gift Interviews: Joel Edgerton, Jason Bateman and Rebecca Hall!". joblo.com. Retrieved September 22, 2015. ^ "On the Set for 1/19/15: Kevin Spacey Begins on Elvis & Nixon, Director Joel Edgerton Starts on Blumhouse Film & More". ssninsider.com. January 19, 2015. Archived from the original on February 21, 2016. Retrieved April 2, 2015. ^ "On the Set for 2/23/15: Pirates of the Caribbean 5 & Snowden Begin Shooting, Joel Edgerton Wraps On Film for Blumhouse". ssninsider.com. February 23, 2015. Archived from the original on June 10, 2017. Retrieved April 2, 2015. ^ Ellwood, Gregory (August 4, 2015). "How did 'The Gift's' Gordo know I'm a Clippers fan?". HitFix. Retrieved August 5, 2015. ^ Grau, Eduard. "Eduard Grau Cinematographer The Gift". Retrieved August 5, 2015. ^ "Streetcar (2013) – Full Cast and Crew". Internet Movie Database. Retrieved August 5, 2015. ^ "Nash Edgerton". Internet Movie Database. Retrieved August 5, 2015. ^ Radish, Christina (August 4, 2015). "Joel Edgerton on THE GIFT, Making His Directing Debut, JANE GOT A GUN, and More". Collider. Retrieved August 5, 2015. ^ Ford, Rebecca (January 20, 2015). "Showtime, STX Entertainment Announce TV Deal and First Four Films". The Hollywood Reporter. Retrieved April 2, 2015. ^ Pedersen, Erik (March 25, 2015). "Joel Edgerton's Directing Debut Gets A Title". Deadline Hollywood. Retrieved April 2, 2015. ^ Roach, Vicky (January 14, 2015). "Joel Edgerton set to direct Jason Bateman and Rebecca Hall in self-penned thriller Weirdo". News.com.au. ^ Zuckerman, Esther (January 14, 2015). "Jason Bateman signs up for Joel Edgerton's directorial debut". Entertainment Weekly. ^ George, Sandy (September 9, 2013). "Joel Edgerton to shoot debut feature in California". ScreenDaily.com. ^ Lang, Brent (February 25, 2015). "STX Entertainment Dates Films With Matthew McConaughey, Julia Roberts, Jason Blum". Variety. Retrieved April 2, 2015. ^ "The Gift (2015)". Box Office Mojo. October 9, 2015. Retrieved December 30, 2015. ^ Eric Pederson, "‘The Gift’ Trailer: Joel Edgerton's Directing Debut Might Make You Rethink Nostalgia," Deadline.com, April 1, 2015. ^ Garett Sloane, "Movie Studio Is the First to Live Stream a Trailer Premiere With Twitter's Periscope," Ad Week, April 1, 2015. ^ "Weekend Box Office Results for August 7-9, 2015". Box Office Mojo. Internet Movie Database. August 10, 2015. Retrieved November 23, 2015. ^ "The Gift". Rotten Tomatoes. Retrieved December 29, 2015. ^ "The Gift". Metacritic. Retrieved August 26, 2015. ^ "The Gift reviews". Deadline Hollywood. Retrieved August 8, 2015. ^ Daisy Bowie-Sell (August 3, 2015). "The Gift". Time Out. Retrieved August 5, 2015. ^ Walsh, Katie (August 5, 2015). "Review: 'The Gift' Starring Joel Edgerton, Jason Bateman, And Rebecca Hall". Indiewire. Retrieved August 5, 2015. ^ Nugent, John. "Jameson Empire Awards 2016: Star Wars and Mad Max lead the nominations". Empire. Retrieved March 15, 2016. ^ Metro.co.uk, Rebecca Lewis for. "Mad Max: Fury Road leads the pack at the 2016 Jameson Empire Awards". Metro. Retrieved March 15, 2016. This page was last edited on 26 February 2019, at 22:30 (UTC).